All this is worthy of celebration! It means that even with all my experimentation, my newness to this age group, and my not-quite-crystal-clear instruction, things are making sense to the kids! My own gains/growth so far include being able to articulate an emerging conceptual framework for doing Math in Your Feet at the primary level. 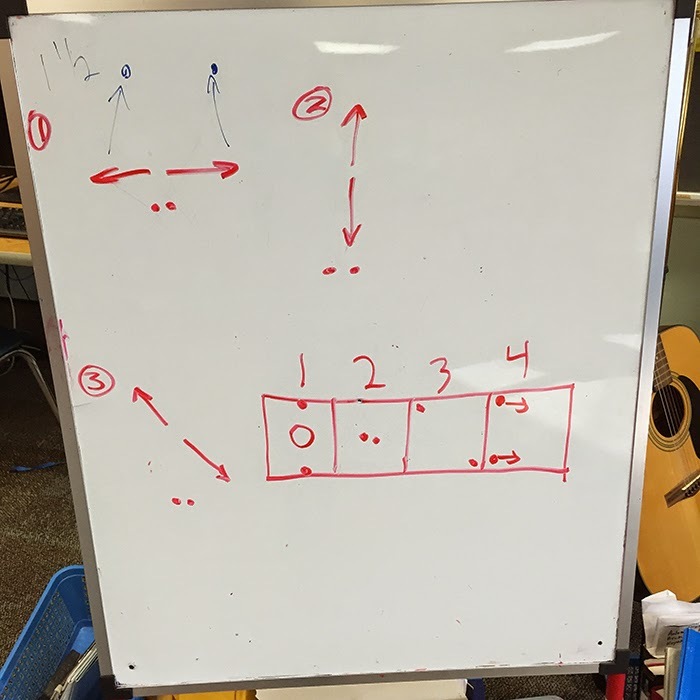 I'm using the same MiYF dance ideas as I do with upper elementary kids but, as I realized last week, K-2s need a different scaffold for the math/dance work. 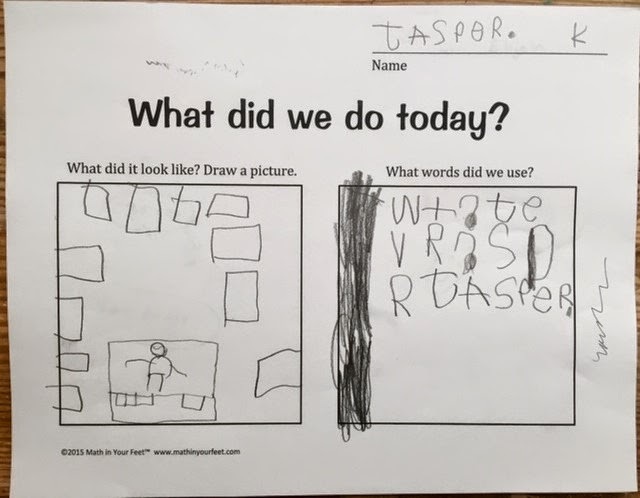 Written and visual reflections after every class. I can see already it's making a big difference in how they understand our work and interact with new ideas the next week. I've illustrated this last point using student work, below. The three maps I've included represent student understanding of position/location/direction and are representative of what primary kids are capable of. Remember, I only modeled a very basic way of thinking about the location of your feet in the square space. 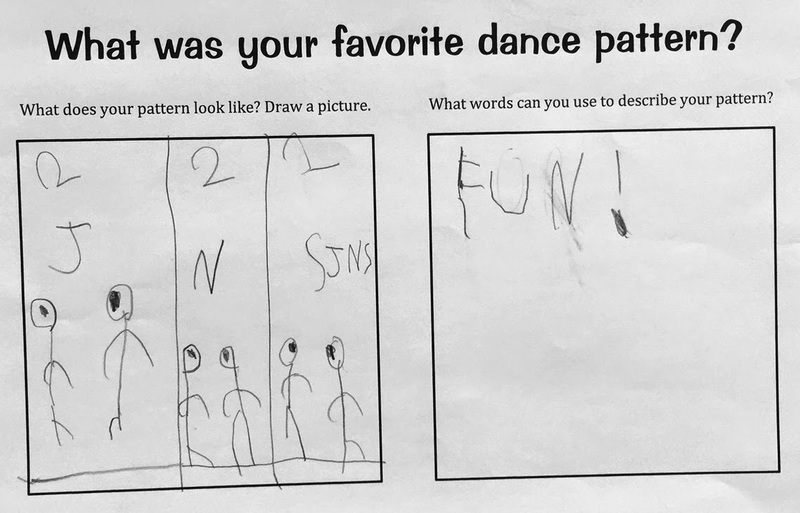 The kids themselves were the ones who decided where they needed to add in more information to communicate their dance patterns. Seriously, I've been blown away by their thinking. 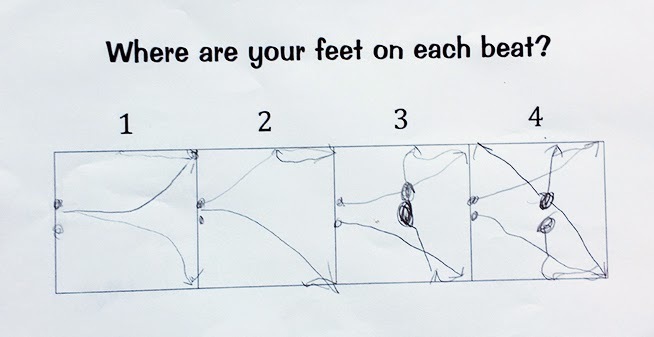 The "where are your feet" assignment is about assessing direction/location/position only. My thought after our 4th session was that we needed to add movement words into the mix. Later in the day I found this map by a 1st grader who had already figured out that she wanted to address this issue! Notice the word "jump" and a line connecting all four beats. On every beat you jump to the new position. It's been super exciting to see how many different ways kids are representing location and direction. This 2nd grader used arrows to indicate the direction of the movement. This kindy girl is very clear where her feet are in the square. On Beat 1 the dot represents a step in the front left corner of her dance space. 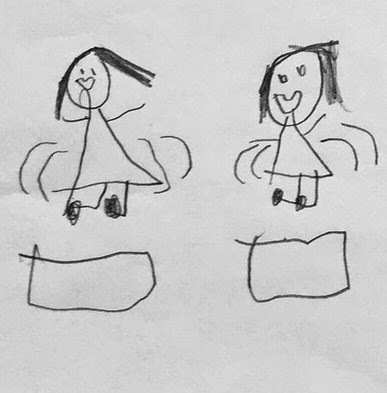 The exciting thing here is that she figured out a way on Beat 2 to be very clear about the fact that the left foot stays put and the it's the right foot that's moving into place. I think we're getting the position / location / direction thing down! And, next week? I think I'll work to bring "WHERE are your feet (location) and HOW did you get there (movement)" further into our collective consciousness. 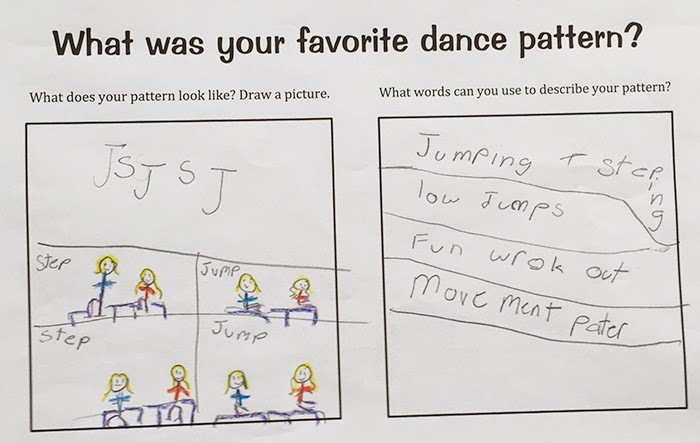 As I was musing over how K-2 kids come to understand what makes a unit, using the new and novel context of percussive dance patterns, the first and second graders at my second school were reflecting on it too. But, since we had last Monday off from school, I didn't get their reflection sheets until yesterday. Overall, I am very happy with the reflection prompts I've created. 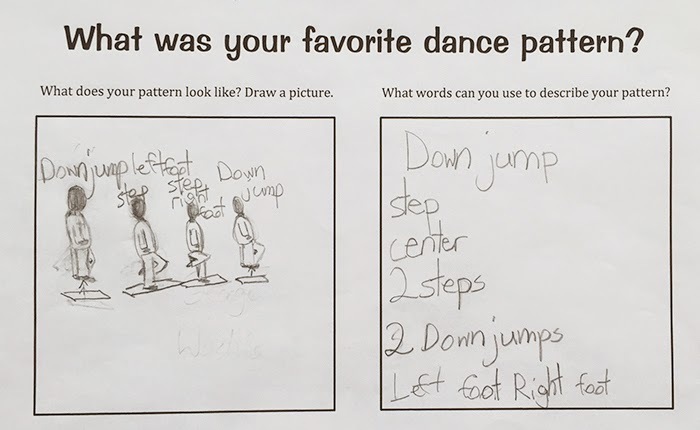 They are doing exactly what I hoped they would do: helping kids settle into the idea of dance pattern units. 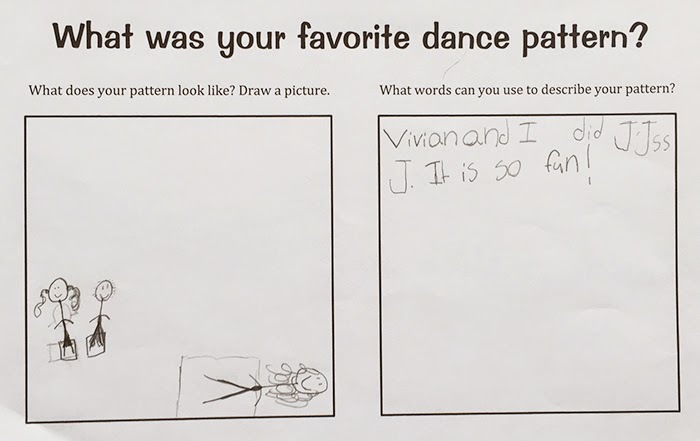 And, in addition to watching their moving bodies and listening to them speak in the moment about what they're doing, the sheets are providing me with a comprehensive view of what kids are thinking and understanding about the dance work. Take a look! This one shows an understanding of the space, the movements we do in that space, and how they are sequenced. Notice the arrows. Steps get down arrows, jumps get up arrows. Also, notice the chart he created to organize the sequence of events. Plus, of course, the cool words! What I love about this one is that the kid in the picture has her hands raised! How exciting! 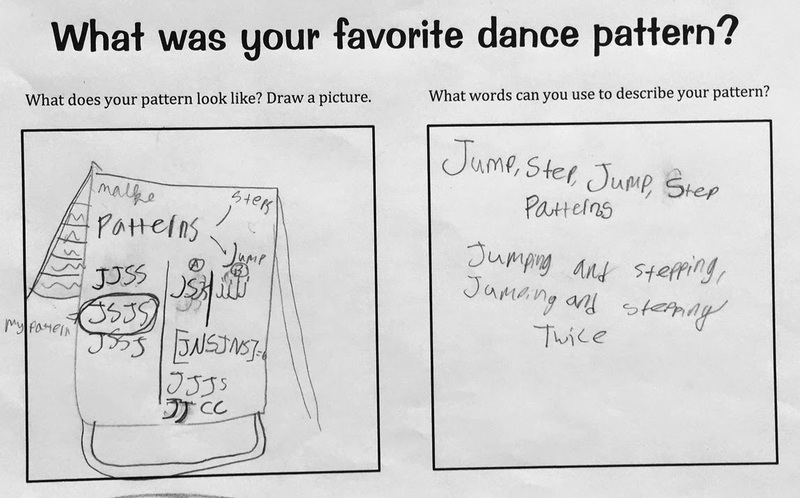 And, this child was able to remember all the permutations of Jumps and Steps we made that day -- back in the classroom, from memory. 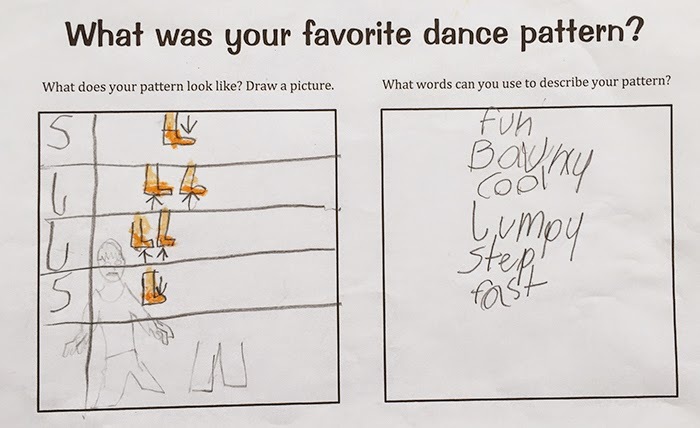 "Down jump" is a special term I use when I teach, grown ups and kids alike. It means that we're jumping up just enough to come down again on the beat. I love that the kid here remembered the term. I also love the leg articulations in the drawing. 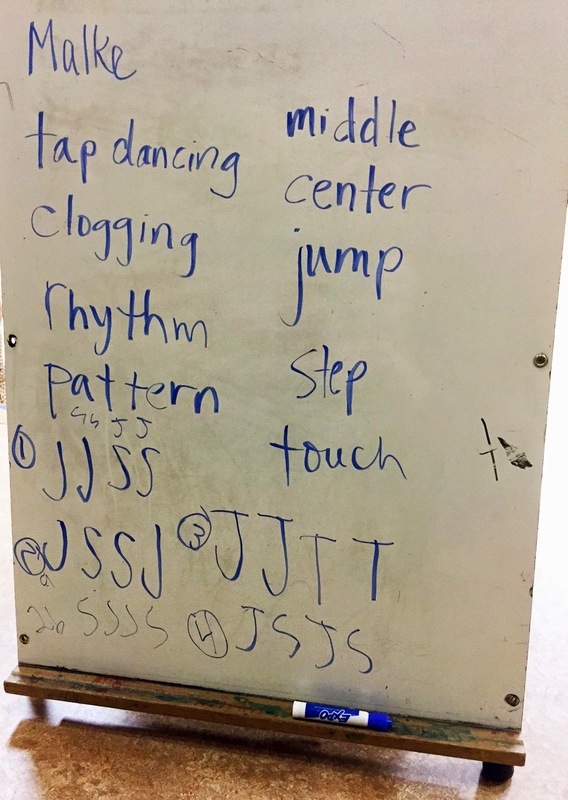 In case you're not fluent in 2nd grade spelling the writing reads: Jumping + stepping, low jumps, fun work out, movement pattern(s). Requiring a written reflection may seem obvious, but you really do have to find the right prompt, which is why I'm really pleased with the responses I'm getting. Since the reflection prompts are fairly open ended I am also very excited and amused by all the different ways the kids are representing their understanding. Monday was a holiday but I got a chance to meet with the K-2 class on Tuesday. I had many thoughts about this class last week, primarily centered on issues of units and unitizing. After leaving those thoughts and observations to simmer in the back of my head for a while I realized I needed to be more present in their dance making. Because this is all just a big experiment for the moment, and my agenda wasn't really cutting it, I needed to see where their dance energy took me in terms of the math. I decided that I would purposefully not make a lesson plan for the next session. I can sense the room going silent, can't you? "If my typical approach doesn't work, what will?" - Whole group instruction for warm-ups, including review of familiar steps and introduction of a few new dance ideas. We had already done jumps and steps in center with our feet together so I decided to introduce the idea of splitting your feet apart. Throughout the class I used spatial language and more formal math language. Out/in can also be sides/center. "Corners" was used interchangeably with "diagonal." My philosophy is that a rich use of language in context of actual doing is useful, effective, and generally assimilated. - Whole group brainstorm: In this case to figure out how many different directions we can split our feet inside our squares. I also summarized our ideas on the board. - Release the group to work in their partner pairs...with the specific instruction to work on and practice these ideas with their partners. In their first two classes I'd given similar specific instructions but was worried because it seemed that what I was showing them wasn't sticking. I couldn't figure out if it was because they weren't unitizing, or whether they were just so full up with creativity (hence the reference to unexpected poppies). This time I was super explicit and redirected kids every time with the statement "It's about practicing these ideas and THEN you're going to get a chance to try out new ideas." - Make a 4-beat pattern you can remember and repeat so that you have something to record at the end of class. They worked hard and their work was super awesome. 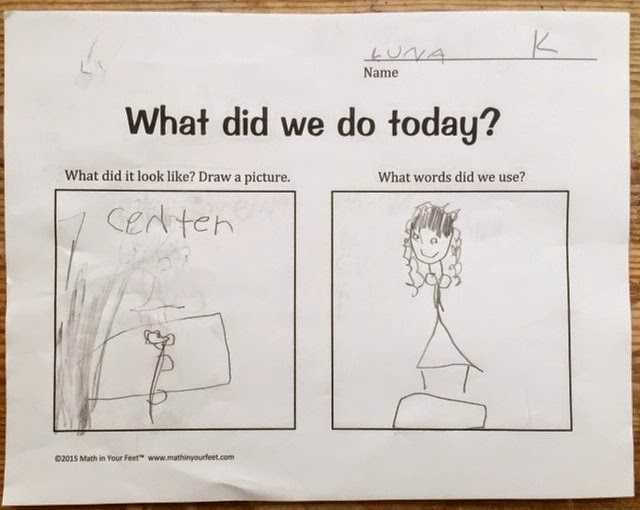 When most teams had something squared away I modeled how I might record my own pattern by drawing where my feet are in my square and then handed out my reflection sheet for the day. 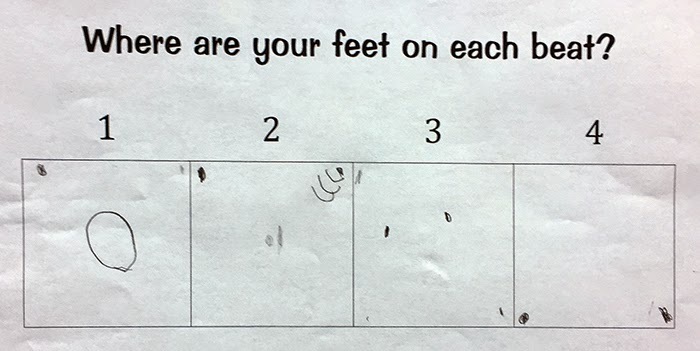 My goal with the recording is to model one idea for representing foot position, but to allow the kids to figure out the way that makes the most sense to them. These are some great examples of the diversity of responses I got. 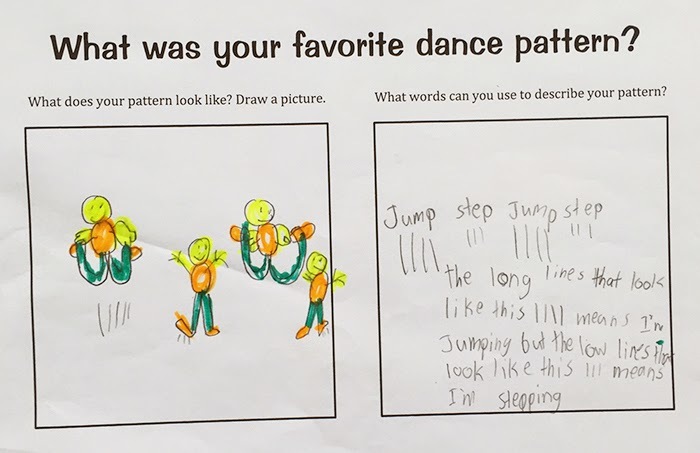 Overall both myself and the teacher were simply overjoyed at the children's creative work, their success with recording their patterns, and the flow of the class overall. The video footage shows lots and lots of kinetic activity. It did feel a little frenetic to me in the moment but upon further review it appears it was as focused a lesson as one could expect in a classroom full of moving and talking 5, 6 and 7 year olds. After all, moving/thinking bodies and children talking to each other is the goal of this work. But my biggest takeaway? That the scaffold IS the lesson plan. I'm excited to try out my new primary grades lesson structure in the coming weeks. Stay tuned! I enjoyed myself and the kids were excited to do their work but throughout the sessions I had an odd sense of dis-ease. This sense was difficult for me to articulate until I transcribed the video footage from both schools but now I'm pretty clear: it's (mostly) all about units. Me to class: I have a question. We have two different patterns up on the board. Let's do them w/ our hands...jump jump step step. Good. Now let's see if we can do the second one...Let's do it with our hands...jump, step, jump, step...[kids keep going...jump, step, jump...] Oh wait! How many times do I do that? [This is where I really started thinking about units; they need to have a sense of where the pattern starts and where it ends.] 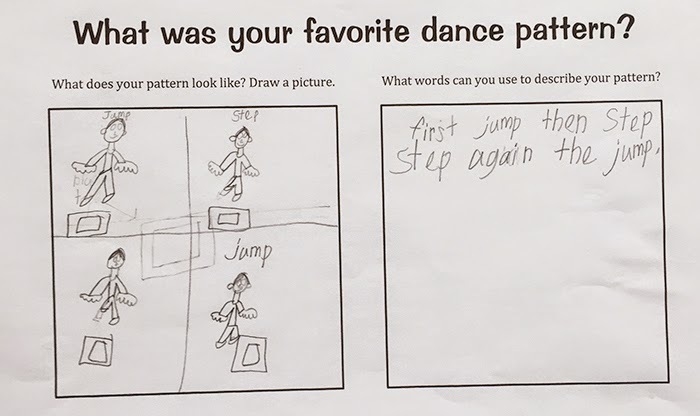 I do Jump Step twice, so there are how many beats? [Kids say Four!] Let's try that with our hands together! [speaking and moving slowly] Jump...Step...Jump...Step. Me: Now. I have a question for you. Can you think of another way to combine two jumps and two steps to make a different pattern? The kids jump to their feet and start working enthusiastically. I stop the group after 2-3 minutes. Me: Before we're done today, if everybody has a pattern that's new to them I want to get it down on the board. Who wants to show their work? Me: I put a line between JSJS and JJJJ. So really, how many patterns is that? I write it on the board and then ask the girls: There's pattern A and there's pattern B. Nice! Give them a round of applause! Who's next?! Me at the board: So what was the first thing they did? [getting feedback from the class, writing down their pattern] And now my question is, is JNSJNS the whole pattern or is it two two of these [JNS]? One of the K girls: JumpNodStepJumpNodStep. Me: Let's count them (using my fingers while I say) JNSJNS...it's...? Me: ...each time I say a movement it's a beat. J N S J N S. How many? Me: It equal's six. And these [pointing to the JS combos written on the board] are four...Okay. At this point I should say that adding in movements other than the jumps and steps I've introduced has become a bit of a theme with all the Ks and 1s I'm working with. 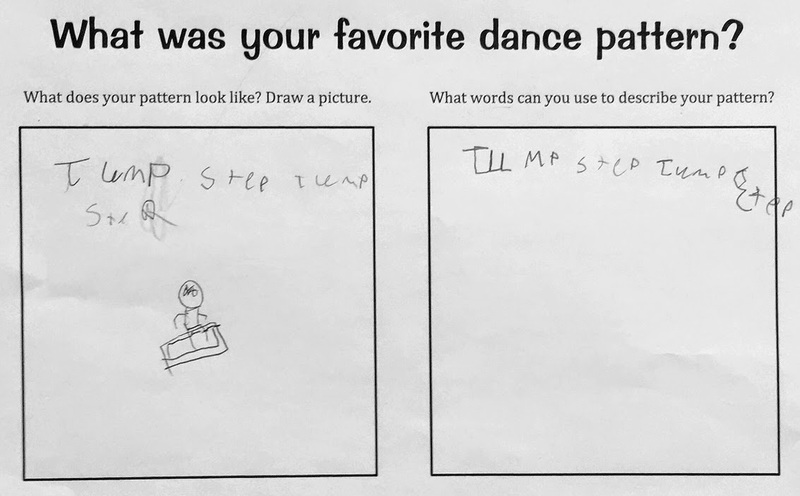 Although I am being as explicit as possible about What Makes A Unit (right now that means steps and jumps done in 2 or 4 beat combinations) K-1 kids have been extrapolating that to mean "Any move you can make on an individual beat." I actually think this is kind of cool and am trying to figure out how to harness this in future lessons. But, I also think it might be related to the conceptual/cognitive development of both units and sets of things. - the direction you move in. And this is why it's fascinating to have these other moves (nod, clap, shoulder movements, toe touches, jumping jacks...some of them from our warm ups, some of them not) show up in the patterns like unexpected wild poppies in the garden. Gorgeous, but because they're prone to reseed like weeds, how will you deal with them in the context of your larger garden plan? In other words, what's the balance between my agenda and their lovely sense of personal and creative agency? None of this bothers me, by the way; I actually find their verbal and movement answers surprising and delightful. But it does make me wonder about my expectations for K-2s in general and these K-2s in particular. I love that this girl drew the white board. It looks exactly the same as the real one! I'm working informally but collaboratively with some math teacher friends to develop a math poetry project. My goal is to provide K-6 kids with authentic experiences with both mathematical ideas/thinking and poetry composition. I want the math activities to inspire rich and generative conversation. The poetry should extend those mathematical ideas and thinking into the larger world of interests, thoughts and actions of each individual child. The first project is about comparison (the pdf of full lesson is here). Comparing one thing to another to find similarities and differences is at the heart of mathematical reasoning and equivalence relations. One thing can be described many ways depending on what you choose to focus on. 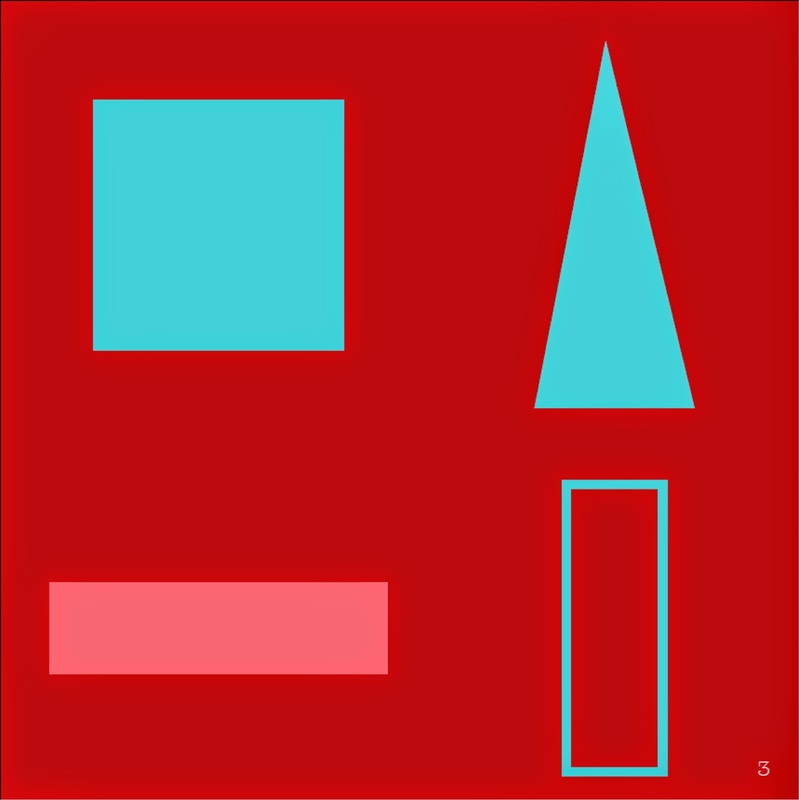 In this first activity, we will focus on sets of shapes with many different and interesting properties. This activity uses the visual provocations from the new book Which one doesn't belong? by Christopher Danielson (you can download the free (for now) pdf here). I did this activty with my daughter's grade 3/4 class today; 24 kids grouped into small groups of 4. Initially I thought I could tell the whole story in one post but after transcribing the rich (and quite fascinating) conversation we had around the first (warm-up) image, I realized I needed more than one post to tell the story. Part 1b of this lesson is here. I love hearing what kids think and why. What was fascinating to me was that although I was clear that the goal was to find "the one that doesn't belong" out of the four shapes on the page this didn't seem to make much sense to them, at least initially. Their small group reasoning showed me that they were thinking of only one general property/attribute: the shape. But the most fascinating thing of all was that they were, initially, only finding differences and very little in the way of sameness. I know that was the question, but in fact, more than one group was convinced that NONE of the shapes were the same as each other. As one girl said: "They are all unique in some way." It seemed that by focusing on difference kept them from grouping the rest into a set. In this introductory portion of the lesson I spent considerable energy supporting them toward a concept of sameness and then a final little nudge toward similarity. Like I said -- fascinating. Me: So I have walked around the groups and it’s very interesting. 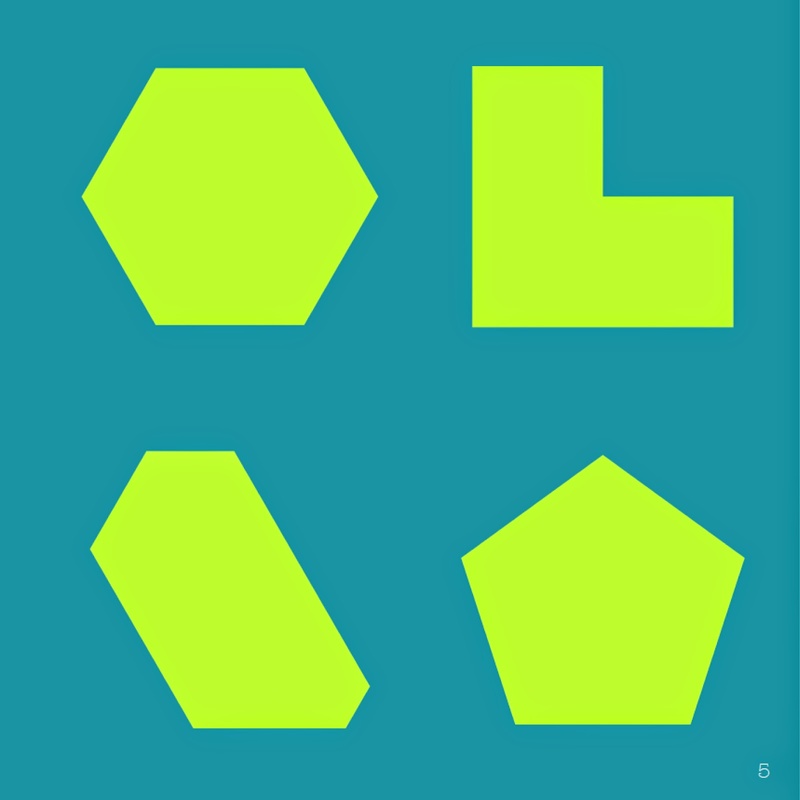 There are a bunch of groups that are saying that none of those little shapes belongs in a group. I will tell you, if there are four shapes, the question is which one doesn't belong to that group? And there will be more than one answer. We’re thinking of them as a whole group, not as individual shapes. There are different ways to look at this. It’s not just the shape. What other things tell you something about them? Me: So what is one thing that three shapes have in common but one shape doesn't? Let’s make a list of the kinds of groups of three you made. 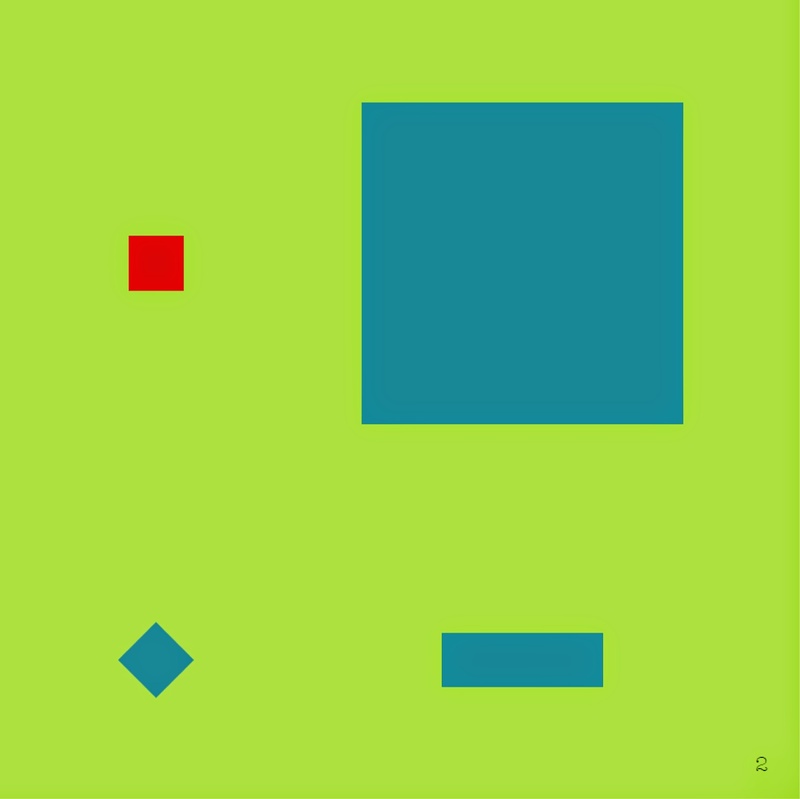 What was the first thing you noticed that three of those shapes had in common? Kid 2: They’re all squares in different sizes and shapes. Me: She’s saying three are squares and one is not? What’s another way you could group those shapes together? Kid 3: All of them have four edges. Me: So that’s a way of saying that they all belong, because they all have four edges. We’re going to start a different category over here. What else? Kid 4: One of them is at a different angle. Me: [Because a LOT of kids were calling the turned square a diamond I pressed the point a little further using their language.] I’m wondering what you think about that little blue shape. Is it a square or is it a diamond? Can you look at that blue diamond-y square. What would happen if you tried to put it right on top of that red square? Kid 5: It depends on the way you turn it. Me: So your definition of a diamond is that it depends on the way it’s turned. But what if you turn the page? Does it look like a square? Can it be both a square or a diamond? Kid 6: Or a rhombus! Me: What other ways can you look at that picture and say ‘these things definitely belong together and this one doesn’t’? Teacher: Remember last year we were talking about attributes...? Me: Yeah, the things we can use to describe something. We can describe them by their shape but how else can we describe them? Me: So which one doesn't belong if we’re looking at color? Kid 8: the little red one. Me: Right now we have color and we have shape as the categories. Are there any other categories that helped you make your decision? Me: Tell me more about that. Kid 9: Three are small but one is huge. Me: Any other way to think about this? Kid 10: Well I already said that one of them was at a different angle. It will ALWAYS be at a different angle than the others b/c you cannot turn that shape without turning the whole paper!!! Me: Got it! So we will say the word “position." So we will say that ‘three are parallel to the edge of the paper’. Does that make sense to you? [class says yes]. Is there anything you want to add to this list? Kid 7: I don’t think any of them belong together. Because they’re all different. They all have something special about them. Me: So you’re saying they’re all different from each other in some way. Can you give me some examples? Kid 7: Well, one is red and all the others are blue. One is a different shape from all of them. At this point I knew they were at a good enough place to take this introductory experience and move on to more challenging images. I need to listen to the audio to decide if I'll report on the second half of this class, but I know that this first 20-25 minutes supported the forward movement of their reasoning in the next section with new images. I definitely heard a lot more descriptive language, both formal and informal, and they seemed more certain in their analysis. Best of all, with some small exceptions, the kids' energy was really strong for the entire hour and they were really listening during our group discussions. You get my drift? My hope is that our work in the shape comparison portion will inspire some really interesting writing. Cheers. Part 1b of this lesson is here! The collectively created permutations using (mostly) steps and jumps. I clap my name because it's an easy way to introduce our upcoming work. I can clap my name with two sharp, hard claps, or two soft swishes from rubbing my hands together. I can clap my hands and then my legs ("up, down") or I can make two deep sounds by hitting my chest. And then I ask my new friends if they have any ideas for how I can say my name with claps. Whatever I do, my intention is to illustrate, from the get go, that there are many ways to do one thing, and that it's fun to experiment with ideas. I also tell them that any time I make a pattern forward, I like to figure out how to do it in reverse (or backward, or opposite) and then we have fun thinking how to "say" my name forward AND backward. Because this was my first session with 2nd graders I had no idea how things might go. So, imagine my excitement that this idea of opposite/reverse/backward actually became a theme that influenced the course of the class. 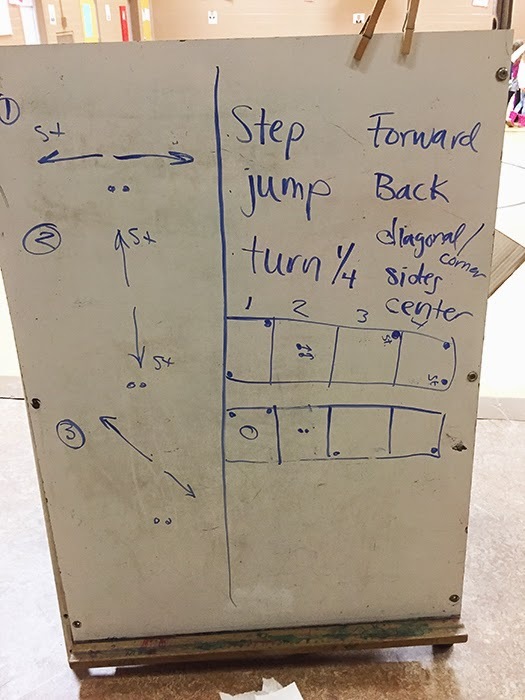 We started with me introducing two movements -- two-footed jumps and single footed steps, both done in "center" which I also described as "middle." Me: What do you think would happen if we put two jumps together and then two steps? What do you think would happen? Boy: Um, it will be four? Me, to the group: It will be four what? Boy: It will be four...movements. Me: Ah, four movements! What else could it be four of? Is there any other ways to describe the four? Girl: It could be a rhythm. Me: It could be a four ... what do we call what makes the rhythm? Me: Yeah, a four beat rhythm. Let's try it together. [Burst of inspiration] Actually, do you guys just want to try it in your little partner pairs? And see what two jumps and two steps look like and feel like? I'll walk around and see what you’re doing. Me: Who wants to show me jump jump step step? Which team wants to show me? Kid in blue: Can we do any pattern? Me: ANY pattern? Did you come up with something else? Me, walking over to our little white board: Wow. You know what, it's not up here on this board. This is from the first graders and look! Now I have a fourth pattern to put on here. You guys dance it and we'll say it and dance it with our hands while we're sitting. Everyone says it with me: Jump, step, jump, step [rehearsing the steps with their hands]. Me: Shhh, sh, sh!! You guys, look at this!! In the other group [first graders] there was JSSJ. You guys were doing the reverse of that! It's the opposite. It's so COOL that you all discovered the SAME thing independently! Okay, one more but it has to be a different pattern from that. Two new girls dance SSJJ. Me: And you know what? 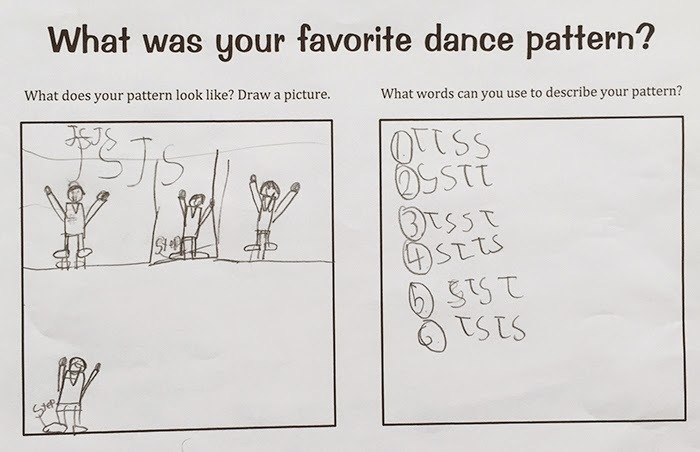 Our class pattern was JJSS but now you did the opposite [writing on board SSJJ.] We have discovered so many patterns out of steps and jumps, it's amazing! Me: I asked you at the beginning to notice something about this space...now I'd like to hear about what kinds of things you noticed about what we just did today. "Well, we did do a lot of two plus twos." "No, we were staying in the middle." I learned that even though second graders still have challenges coordinating their bodies, they can stay in rhythm as a group, work productively in teams of two, and do original (to them) mathematical thinking. On the first day! p.s. I would love to hear your thoughts about the words opposite, reverse and backward. And, after this workshop, I somehow came across (w/o searching for it) the idea that inverses are important to permutations. If you have thoughts on that, I'd love to hear those too!